Darfield is the royal capital of Mobrin and the seat of Darfield Duchy. 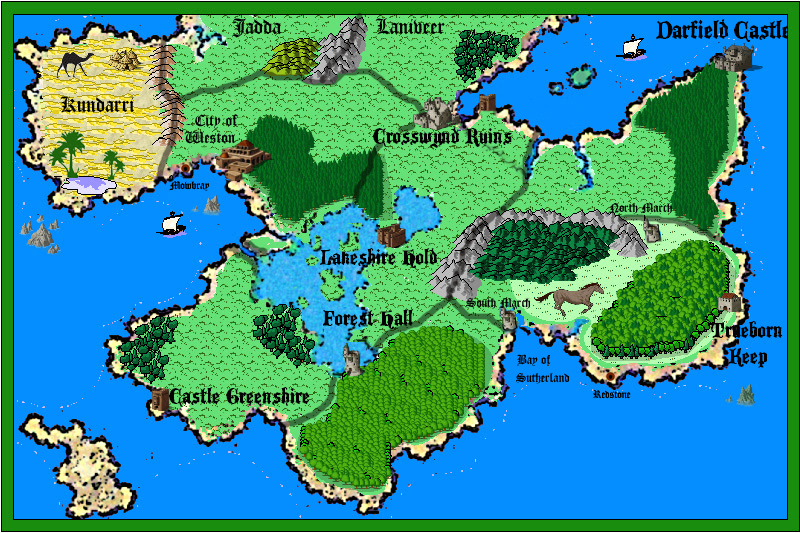 Darfield Castle, and the City of Stormvale, is also the location of our game. 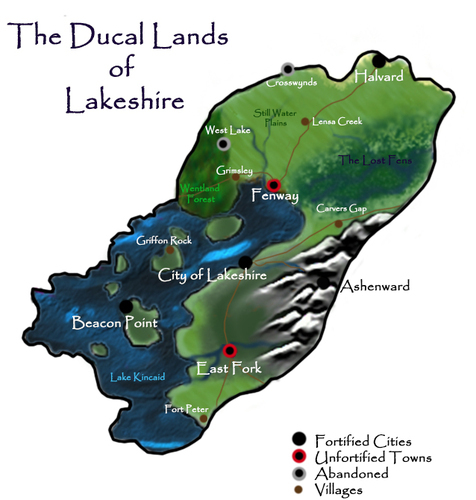 The Duchy of Darfield is made up of gently rolling hills and forested areas. The border of Darfield, in the south, is the Pine Mountains. Gold is pulled from mines in the south. Darfield is known for fielding heavy infantry and light cavalry, some of the best in the land. They also receive conscripts from the vassals of the King, to serve in the Royal Army. Sutherland is located directly south of Darfield. The Duchy of Sutherland consists of gently rolling plains, and woodlands. Sutherland has been made rich due to gold mines in the Pine Mountains. They are well known for their light cavalry, some of the deadliest and most fearsome horsemen on the continent come from Sutherland. The ducal family in Sutherland has had a tradition of breeding the finest horses a man could possibly have. The people of Weston have a great history. 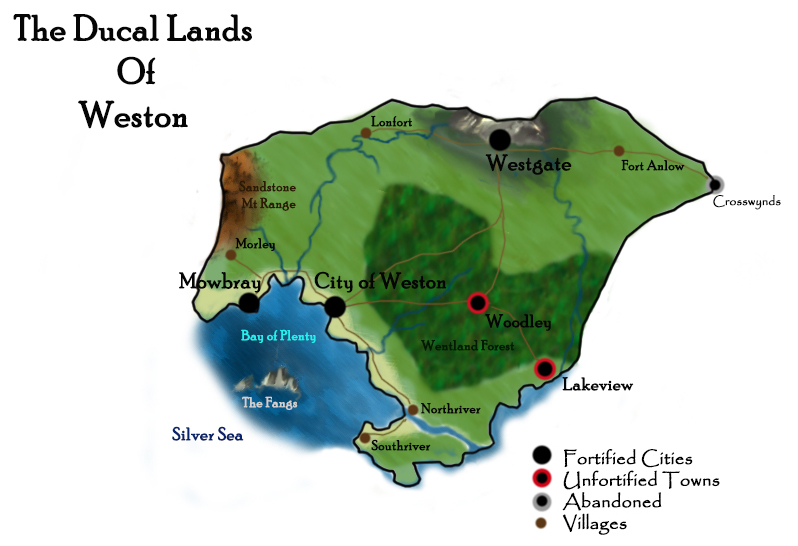 The city of Weston is located on the Silver Sea, one of the largest cities in the world. Weston is known for their cultural and scientific contributions. The Duchy of Weston is also known for having the best seamen in the world. The shipping lanes of The Great Sea are timid and mild compared to the Silver Sea. The port of Weston is constantly filled with huge vessels, shipping product from Mobrin to Jadda, and to The Hills. Weston also shares a border with the Kundari Desert, Jadda and Laniveer, and is often on the receiving end of any attacks headed towards Mobrin from these sources. Lakeshire is located southwest of Darfield. Lakeshire Hold is located on Lake Kincaid. The region around the lake is lush and green, very well tended. The people of Lakeshire are known for having helped crushed the Laniveer advance in both great wars. Their swordsmen are some of the best in the land. They are also known for having great blacksmiths who forge the best weapons and armor in all of Mobrin. To have a true blade forged from Kincaid steel is a great honor. Sky Forest is located the furthest south of all the provinces, on the Great Sea. Sky Forest's borders are east of Greenshire and south of Lakeshire. Sky Forest or 'The Forest' is best known for their great forest, the largest on the continent. The people of Sky Forest are a rugged people, with some of the best hunters in the land. Greenshire is located on the western half of Mobrin. 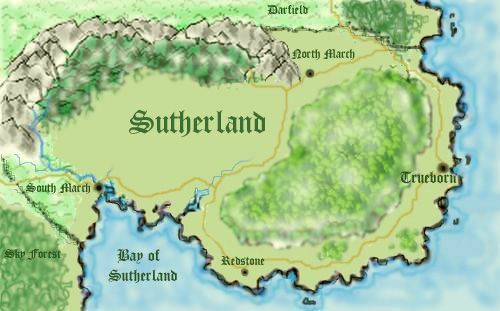 Greenshire is located in the west, with a long coast on the Silver Sea. 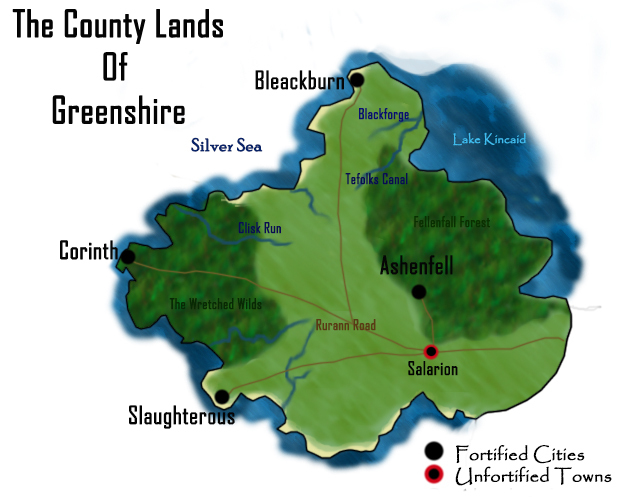 The County of Greenshire is best known for its farmlands, and lush prairies. Greenshire is also known for their archers, the finest in the land. For general scale it takes approximately one month IC time to travel from Darfield to Jadda, or from Darfield to Greenshire. This is for travel by horse but at a modest pace and not in a rush. A cart or a man on foot might travel the same if they push hard or they may take twice as long if they don't. An army is going to travel slower but knights pushing on horses may be faster. For the King's Post or anyone else with relays of fast horses for important couriers, the distance could be covered in two weeks or pigeons can be sent within a few days for communications. A ship going around the coast is about a month from Darfield to Greenshire depending on currents and weather for the season. If it's a slow, laden merchanter it may take longer or shorter for a fast war vessel. The list below lists both slower and faster time frames depending on mode of travel. This is for the purpose of IC time. However, for the purposes of OOC to facilitate RP, staff will handwave travel times at the discretion of the story teller (usually by half or down to 1/3). If in doubt, ask! This is a guideline only so it's not carved in stone. As Sutherland is on grid keep this in mind. ; It would take about a week to reach Trueborn from Stormvale in Darfield at a leisurely pace - or three days by ship or King's Post with relay horses. That is IC time. For OOC, we don't want to be nazies so let's say at least one RL day to travel there and RP but don't be showing back up in Darfield again for at least another RL day, please. 1) Stormvale, Darfield to Trueborn, Sutherland. 2) Trueborn, Sutherland to South March Bay, Sutherland. 3) South March Bay, Sutherland, to Southern tip of Sky Forest, or Sky Forest Hall (roughly). Add these up and you get about one month travel from Stormvale to Greenshire for IC distance scale. Times are approximate. Or by very fast King's Post cut the time in half. For OOC purposes an ST could say a few RL days for RPed travel time at their discretion. 5) 2 weeks from Stormvale to Lakeshire castle. 6) 2 weeks minimum travel by land from Stormvale to southern border with Laniveer. Obviously longer if you were marching an army and about three days by sea. 7) 2 weeks roughly from edge of sea at southern border of Laniveer into Jadda (or one month from Stormvale to Jadda). 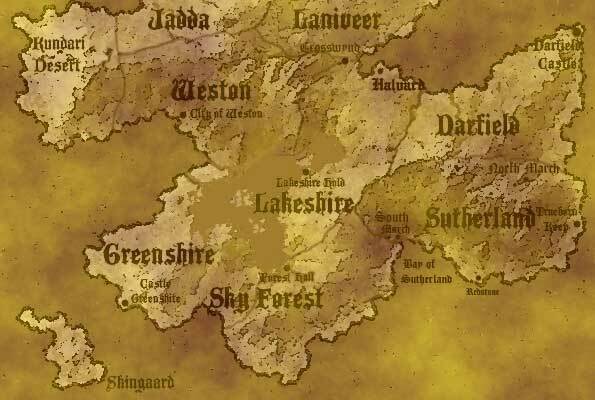 8) 2 weeks roughly from edge of sea at southern border of Laniveer to City of Weston (or one month from Stormvale to City of Weston). 9) 1 week from City of Weston to Kundari desert. 10) 1 week from City of Weston to castle of Lakeshire or slightly less, and almost 2 weeks from City of Weston to Slaughter castle in Greenshire due to water crossings. Use these as your guide. When in doubt, pull up a map and measure, then compare with various distances on the Mobrin map. Staff may handwave these distances for TP's with PC RP, or choose to stick to them for how long to wait for troop movements, ships sailing, so forth for +requests. - Lakeshire Hold, Forest Hall, Trueborn Keep, City of Weston, North March, South March, are all /fortified/ castles and defensible structures of various kinds. Don't let the names fool you. - Red dots with black centers are /unfortified/ manors; Redstone and Fenway are examples. These are not castles and minimally defensive. - Click on any map to see it full sized if details are hard to read. - The following maps are for each region as they are roughed out and adjusted.